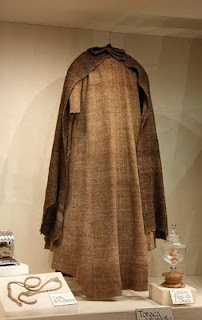 Unlike the Dominican Nuns, of whose beginnings we have little evidence, the history of the foundress of the Poor Clares, St. Clare of Assisi, is well known and the Poor Clares have even preserved such items as her tunic, mantle and cord! 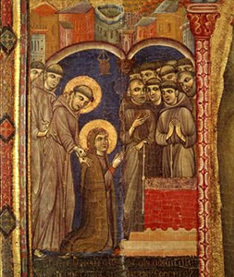 Today, March 18th, is the 800th anniversary of the night St. Clare ran away from home and was received by St. Francis and his brothers. He cut her hair and gave her a poor tunic and placed her in the care of the local Benedictine Nuns until a place could be established for her and the other noble women who followed her. We wish our Poor Clare sisters all over the world a very joyous anniversary and pray that they will always be faithful to the charism of total, voluntary poverty, espoused to their Crucified Christ.